U. S. Mail Supply is your online source for USPS approved and private use mail boxes for commercial or residential properties. We have virtually every type of mailbox made, all built with steel and/or aluminum to ensure many years of trouble-free service. 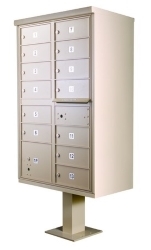 From simple wall mount mailboxes for residences to pedestal mounted rmailboxes for apartment complexes with hundreds of residents, we have mailboxes for every purpose. Shop our full line of USPS approved and private use mailboxes for everything from small businesses to multinational corporations. We carry both indoor and outdoor mailboxes, all made in the USA and available in a range of architectural-friendly colors to work with any building's color scheme. 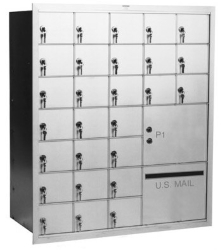 4C mailboxes are the de facto standard for multi-tenant buildings of all types. They can be wall mounted indoors or pedestal mounted outdoors. We carry USPS approved 4c mailboxes in a variety of architectural friendly colors and a range of options for configuring them. If you want the mailman to deliver your mail, you need to have USPS approved mailboxes. U.S. Mail Supply has a huge inventory of USPS approved mailboxes for businesses of all types. We have both pedestal mounted mailboxes for outdoor installation and wall mounted mailboxes for indoor installation. 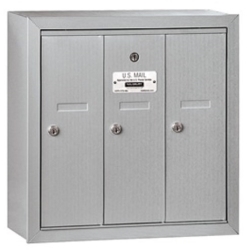 U.S. Mail Supply has a great selection of mailboxes for apartments and condominiums. We have everything from basic pedestal mounted mailboxes to mailboxes with decorative pedestals and caps to blend in with historic architecture. 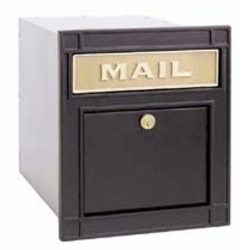 We also carry wall mount mailboxes for use in lobbies and entrance areas. Outdoor pedestal mounted mailboxes are the preferred choice for many businesses, government buildings, military bases and multi-tenant buildings. We offer both USPS approved mailboxes, and private use mailboxes for internal distribution of mail. 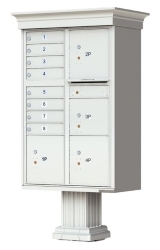 U.S. Mail Supply offers deep customization of indoor mailboxes. Choose USPS approved or private use models, vertical or horizontal orientation, front or rear locking options, and even the option of package-sized compartments. U.S. Mail Supply is your source for quality-built residential mailboxes—both the wall mount and the post mount varieties. We carry only high-quality, US-made mailboxes, built to be the last mailbox you’ll ever have to buy. 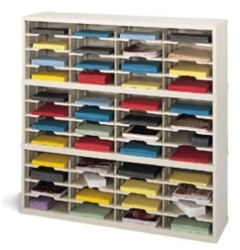 Mail sorters are not only essential for mail rooms, they’re also incredibly helpful as literature organizers for businesses, warehouses, classrooms and anyplace else that has dozens of different printed materials to keep organized. We only carry mailboxes that are built to last. Look around, and you’ll probably find a cheaper version of whatever mailbox you find here on our website. Watch out, though. Bargain priced, Chinese-made mailboxes may look similar, but they aren’t built to the same high standards, or with the same quality materials, as the U.S. made mailboxes we carry. 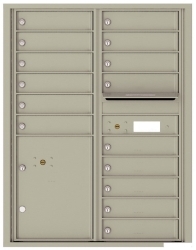 All surface mount and recess wall mount metal mailboxes from U.S. Mail Supply are built with aluminum and steel for longevity and long-term strength against the elements and heavy use. Our outdoor pedestal mount mailboxes stand tough against both the elements and time while keeping mail safe and secure from theft. 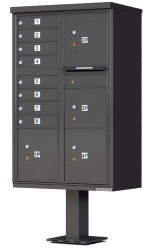 You choose your desired door count, package lockers, outgoing slots, rear or front loading option and whether you need USPS approved mailboxes or intend to use them for internal distribution of mail only. Once you have your options narrowed down, our design staff will create a rendering of how your mailboxes will look and provide you a quote. Get started today by clicking on the option above that best matches the type of mailboxes you’re considering.